Two words best describe the Catalina Goby, “small” and “innocent”. They often become the subject of bullying by the larger sized fish and if you intend to successfully rare them as pets in home aquarium, it is best that they should not be mixed with the other saltwater fish. Sometimes even with some less harmful friendly companion, you will find that they will frequently dart into their hiding space as the Catalina goby is a very sensitive species that is wary on what happens around them. If you have intention to introduce your pets into a community setup as bottom dwellers, you should first consider the fact that your fish will require living in cooler water temperature, best controlled between 15 – 21C (59-70F). Thus, all the other tank mates should share the same cold water requirement, or else it will be impossible to mix all of them together with your Catalina. Although there are reports of goby thriving in warmer tropical water but doing so will actually reduce the life-span of your pet fish. In an ideal environment they rarely survive above 18 months and under stressful condition like the one mentioned earlier, you can expect the life-span to be shorter. Thus my advice is that in a single reef tank, there should only be one breeding pair. Do not worry about making mistakes on the identification process because the male can be easily segregated from the female based on its longer extension of the dorsal fin which turns out like a sharp spine. You should also try to avoid keeping more than one breeding pairs because male gobies are known to fight with each other especially when it comes to territorial dispute. The only exception is when you have a very large tank but avoid at all cost when it comes to having only a nano aquarium. The Catalina Goby (Scientific Classification: Lythrypnus dalli) is a very beautiful fish characterized by its appearance of purplish blue color band appearing on its overall red body. As you can see from the picture above, the alternating band starts from the head section and then moves towards the middle of its body. Some gobies can be seen having 5 to 6 of these vertical bands but it is not unusual to see smaller number of the fish having only 3 of it. 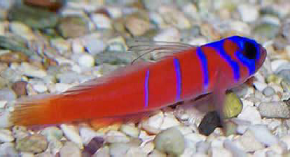 Because of that feature they are also called Blue-Banded Goby. Considered as timid creatures which often stay idle most of the time, they are not strong swimmers but their pelvic fins have evolved to become something like an anchorage device which helps them to cling onto any surface so that they can stay put on the same position of their choice despite the strong currents. In the wild, these moving water current actually carry along live food particles which can be sieved and eaten by the goby as they remain motionless at their current position. For the aquarium setup, you should ensure that you have plenty of cave structure and if you are a fan of nano aquarium, you should consider putting the Catalina Goby on top of the list of potential candidates. Normally, a well-established reef tank would be a suitable choice to house your Catalina goby because the nooks and openings created by these live rocks will allow them to retreat and spawn away from attention. In addition to that, the tiny microorganisms and small invertebrates which are found living among and under the rocks will also provide some source of food supply. And lastly, before you forget, because they are cold water fish, they will require fish tank equipped with a chiller to maintain the lower temperature setting and this is something which is a must. If you can afford a wave maker, that would further help but this may not be necessary as the normal aquarium filter usually create enough water turbulence. If you can sustain a healthy population of live foods such as codepods or mysid shrimps in another separate refugium, that would be the best as it will ensure that these supplies will always be readily available and would never run out. For smaller fry, you can also introduce live foods such as rotifers which can be bought from pet shops or you can also cultivate brine shrimps from eggs. Note that Catalina Goby can easily breed under the right condition and usually they do not require intervention from the aquarist. As long as the water temperature is right and food supply is in abundance, soon enough you will see small fry appearing. The female fish will lay the eggs inside empty shell or underneath the caves and then the male fish will be tasked towards guarding the eggs until it hatched. The survival rate will depend entirely on how well you ensure the food supplies keep on coming and on top of that, make sure that the water stays crystal clear all the time. With time and effort, the small fry will soon grow up to begin the next cycle and as a reference guide, a normal adult size should not be less than 2.5 inches.